The 20th letter of the Hebrew alphabet is resh. 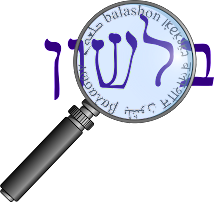 It gets its name from the original shape of the letter - like a rosh ראש - head. In addition to "head", rosh can also mean "chief, leader", "top, summit", "beginning" and "principal, capital". Some other word derived from rosh are rishon ראשון - "first", reshit ראשית - "beginning", and rashi ראשי - "chief, primary". The Aramaic version of rosh is closer to our pronunciation of the letter - ריש resh. From here we get the word reisha רישא meaning "the first part (of a Mishna)". In Arabic, ras as head is found in many place names such as Ras al-Khaimah ("top of the tent") and Ras Tanura ("head of the barbeque spit"). Rais is another Arabic derivation, meaning "president". As we have seen earlier, resh can interchange with lamed and nun. Steinberg adds that the similarity of the shapes of resh and dalet cause them to alternate as well - for example ראה (Devarim 14:13) and דאה (Vayikra 11:14). Resh is occasionally added to three letter roots and words: שבט / שרביט , כסא / כרסא. In other cases, the resh is assimilated - כרכר becomes ככר.